With one of our two Phnom Penh nights dedicated to New Year’s Eve celebrations, we didn’t have a lot of time to explore the local cocktails. But after some solid research and with the help of my BFF cocktail companion, we settled on a mini bar crawl that showcased the different kinds of cocktail vibes available in the Khmer capital. This Pan-Asian restaurant located in an historical Chinese villa with a French colonial façade regularly hits ‘best of’ lists for local food and fun. And, while the fusion plates are fine, the big draw here is really the décor. Inside its all distressed walls and exposed wooden beams that serve as a backdrop for elegant eastern touches and large prints of pretty China girls. The tidy fleur-de-lis floor tiles recall its east meets west past, the spirit of which still carries through to their tagline of today: “European sophistication meets Asian charm.” While I was less interested in the Lychee Martini, their classic dry was nicely done. And the best spot to drink it? 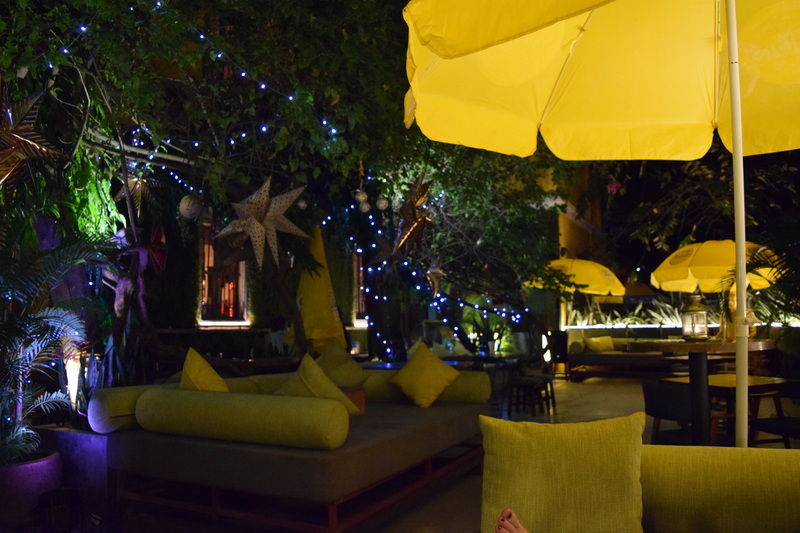 In the lovely garden terrace on the comfy cushioned couches under paper stars, fairy lights and big yellow umbrellas. Le Boutier bar hit the scene with ready-made craft cocktail cred, having been created by Chicago mixologist Anne-marie Sagoi and NYC-based Pouring Ribbons co-owner David Chhay. This three-floor modern lounge incorporates local ingredients like fish sauce or sticky rice syrup into their clever menu with its quirky graphics and stories behind each cocktail. The Monkey Dance is named after signature moves of Cambodian singer Pen Ran. 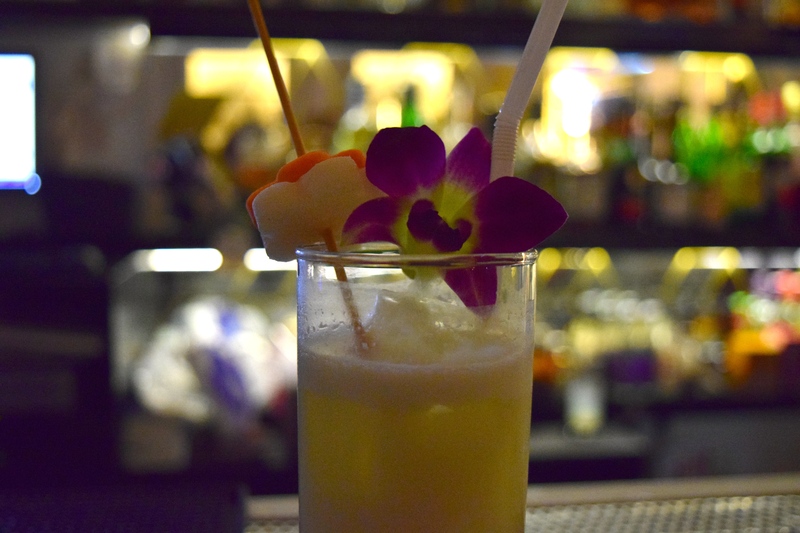 Ran was popular in the 60s making her an appropriate inspiration for a cocktail as the team here hopes to “rekindle the energy and spirit” of that “Golden Age” of Cambodia. 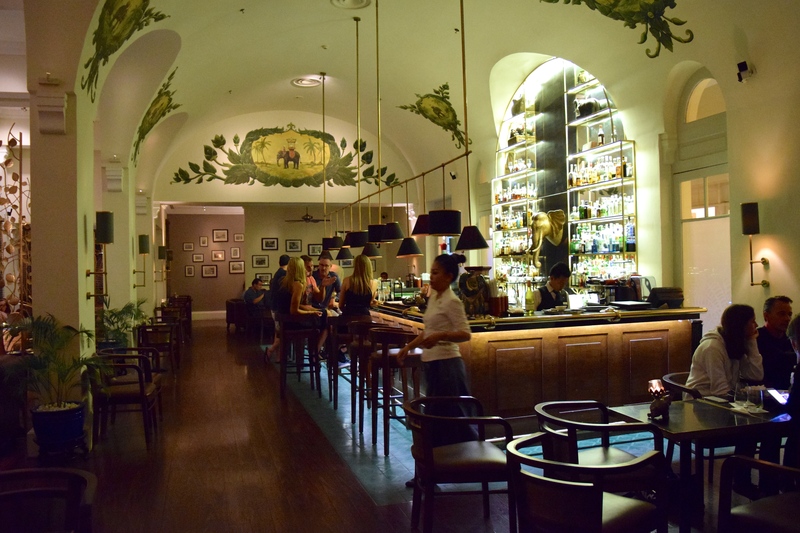 Head up to their tiny rooftop terrace to enjoy your tipples while watching the busy street life below.